Land is scarce in the inner city of Tokyo and restful green spaces few and far between. 'Shinjuku Gardens' - in the thriving hub of Tokyo's inner city, is a conscious effort to make the most of the available open space; pushing boundaries in a quest to amalgamate much needed natural landscape into the infrastructure of the city. The project raises economic, social, environmental and cultural awareness on various aspects. The design strategies aim to maximize investment returns by providing more than double the amount of car parking spaces; optimize opportunities to inject greenscape to reduce CO2 exhaust emissions, and promote the arts and culture by offering spaces for art exhibitions in the city centre of Tokyo. Shinjuku Gardens is an urban intervention, which aims to create a ground for nature to co-exist within the dense city context. 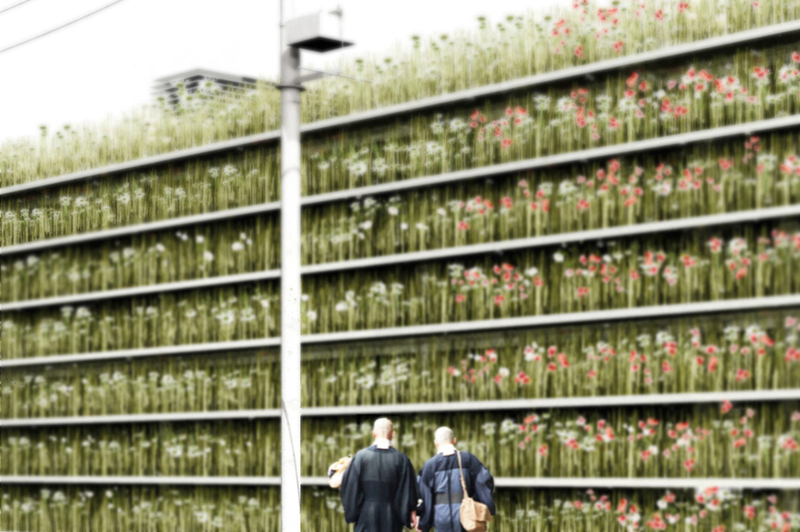 Alternative to only allowing a sliver of landscape to establish within the urban grain of Shinjuku, like a singular wild grass growing between cracked asphalt, the project considers the macrocosm of nature and how wild flowers can be used to fill the facades as blank canvases with changing colours all year round. The façades and roof-top will become a naturally grown biotope. 'Shinjuku Gardens' replaces an existing open car parking lot (with 80 car parking spaces, equivalent to a ratio of 27.5 sqm of GFA per parking space) with a 2-storey car park; rendering the site with a sheltered 'green-wall-gallery' which will accommodate an additional 83 parking spaces (providing a total number of 163, which offers a ratio of 19.6 sqm of GFA per parking space). Appreciating the economic value of land, the car park adopts the most efficient parking layout grid. Replacing conventional car ramps with car lifts will maximize parking spaces; minimize traffic congestion, safety hazards and waiting time. This highly rational 54m x 33m parking structure occupies 22% less site coverage compare to the existing layout, leaving more quality public green spaces and allowing light and air to penetrate deeper into the already dense urban environment. External pedestrian ramps are inserted to provide public access to the rooftop garden and park-gallery above ground. The rooftop garden is a new green oasis above the dedicated car park facility. This intimate social space above the infrastructure and man-made concrete structure is freely accessible and animated by the public at all times. The changing green wall throughout the seasons. Research and studies on local vegetation and wild flowers. The simple, restrained and clear material palette subtlety blends in with the existing city fabric. The 'soft-cladding' of the structure is characterised by the wide balustrades to allow grass to coat the exterior of the frame, creating layers of 'green living-walls' as enclosures to the structure. Visually, the architecture enriches the community with layers of translucent green-curtains, while shielding the views of parked cars. Functionally, the 'soft-cladding' utilizes the fields of grass to absorb CO2 exhaust emissions, acting as clean air filters between the buildings. The two levels of car park are envisaged as park-galleries, where street artists are invited to exhibit their artworks onto the surfaces of walls, ceilings, floors and structures. Architecture and art emerge as one entity, literally increasing the physical dimensions of ‘canvases’ for young artists and creating opportunities for contemporary art exhibitions. The roof garden will also be utilized for displaying of permanent and large scale installations. Parking lot boundaries, typically demarcated by thin painted lines are now marked by potted flowers. This nonvisible ‘line’ might seem ephemerally radical, but it certainly engages greater social awareness and responsibility, even in a small gesture of way finding experience through the car park. This intervention allows people to interact and begin to think deeper about the environment. Using structural columns and structural slabs as blank canvases for artists to create art might be a new culture to bring the arts into the everyday lives. Exhibiting art within found spaces is undoubtedly an economically viable and functionally manageable alternative to make the arts more accessible to the public. The project blurs between architecture and art; turning a conventional car park project into a Street Art Museum - looking deeper into the everyday ordinary environment to seek surprising findings. Appreciating small events like walking through the parking deck might allow one to uncover new findings of the everyday – a painting on the floor, a scattered potted plant or even a flower blooming – we might just find new interpretations in our daily context by seeing things in a new way.